Ladies Night, a pencil, pen, watercolor piece by Richard Davies of White Hall, is one of 39 works on display in ASC’s International Paper Gallery as part of the 2019 Small Works on Paper touring exhibition. Annual touring show Small Works on Paper — often dubbed simply “SWOP” — is kicking off its 32nd year with a two-week exhibition at the Arts & Science Center. The show officially opens with a free public reception Saturday, January 12, 1-3 p.m. Ten participating artists will be on hand to speak during the reception. Small Works on Paper is a program of and sponsored by the Arkansas Arts Council, a division of the Department of Arkansas Heritage. The juried visual art exhibition showcases two-dimensional artwork no larger than 18 x 24 inches by Arkansas artists. The artists must be members of the Arkansas Artist Registry, an online gallery that is free and open to all Arkansas residents. The artists are invited to submit their work each summer — entry fees are $10 for one entry, $20 for two entries, or $25 for three entries. An out-of-state juror selects a maximum of 40 pieces to tour with the exhibition. Cash prizes totaling $1,000 are awarded each year. The exhibition travels to up to 10 locations in each yearlong show, offering Arkansas artists an opportunity to have their work viewed by patrons all over the state. Many of the works are available for sale to the public, and commissions are not taken on the sales. This year, 39 works by 37 artists were selected, including Richard Davies of White Hall and Markeith Woods of Pine Bluff. Do You Remember What I Worked For?, a mixed media piece by Pine Bluff’s Markeith Woods, was named Best in Show. Woods received Best of Show ($500 Award) for the mixed media piece Do You Remember What I Worked For? Other recipients were Juror’s Choice ($300 award) winner Daniella Napolitano of Little Rock for the linocut Curia Regis, and Merit Award ($200 award) winner J.P. Bell of Fayetteville for his digital photograph Repair of No. 2. Daniella Napolitano of Little Rock earned the Juror’s Choice award for the linocut Curia Regis. Repair of No. 2, a digital photograph by J.P. Bell of Fayetteville. received the Merit Award. Robin Dru Germany, professor of photography and interim director of the School of Art at Texas Tech University in Lubbock, Texas, served as this year’s juror. “In selecting the exhibition, I looked for works that highlight the artist’s engagement with the process of making art,” she explained in her juror's statement. “I am drawn to works that I feel are authentic, genuine and personal. Uniqueness is less important than evidence that the artist is continually exploring, perhaps seeking the answer to a question. Sometimes the question may begin as a technical query, or as a conceptual one, but I seek work that seems to be part of a process of figuring something out. I use the word ‘process’ because I value artworks that defy an ending and instead propose a beginning, opening the door to a larger consideration of the subject or concept. I perceive artmaking as a continuum, where selected pieces represent the best of a particular moment. Consequently, my choices are not based on medium (though as a photographer, I could have picked only photographs), nor are they based on subject or approach. Rather, they are grounded in a sense of the artist’s commitment to learning through their work, and allowing the activity of artmaking to reveal to them fundamental truths about their lives. Small Works on Paper originated in 1986 with a temporary exhibition at the University of Arkansas at Little Rock. It launched as a touring exhibition in 1988. The exhibition was coordinated by the Arkansas Artist Registry at UALR until the registry became a program of the Arkansas Arts Council in 1995. The Arts & Science Center first hosted Small Works on Paper in 1995, with 2019 marking the exhibition’s 17th stop at ASC. Small Works on Paper is on display in the International Paper Gallery until Saturday, January 26. After that, it moves on to the University of Arkansas at Monticello’s Taylor Library. See the touring schedule for a complete list of 2019 venues and dates. My work describes my personal narrative of my life experiences. I’ve created mixed media works of art that describes the difficulties of living a purpose driven life and the importance of using one’s influence for a greater cause. I create leaders that made an impact in their communities. However, growing up in Pine Bluff, I had an uneven start and made several bad choices. I didn’t have a visual example of who I could become so when I met my UAPB art instructor, they gave me hope of a better future besides living in poverty also was willing to show me the process. My style is mixed media expressionism. What was the inspiration behind the two pieces selected for Small Works on paper — Do You Remember What I Worked For? and What Do You Believe In? The lady wearing the crown in Do You Remember What I Worked For? is Alice Paul, and the man wearing the crown in What Do You Believe In? is W.E.B Du Bois. The inspiration for the Alice Paul piece is her values, beliefs, and principals. Because of the work she did as a women's rights activist, her efforts helped to pass the 19th amendment [which granted women the right to vote]. As an African American, I feel there are several bills that need to be created for the betterment of blacks living in poverty. The inspiration for the W.E.B Du Bois piece is he that was the first African American to earn a doctorate degree from Harvard University. I’m the first out of my family to pursue a career in art, and when you are the first in striving for a goal, one must work harder to achieve it. Also, people won’t understand the choices/steps that must be planned in order to make the vision a reality. Where do you currently live? Where did you grow up? I live in Pine Bluff, and grew up here most of my life. I graduated with a Bachelor of Science degree in Visual Arts from the University of Pine Bluff in 2014. I also have 33 hours towards my Master of Fine Arts degree from Memphis College of Art. I am an art teacher at James Matthews Elementary School in Pine Bluff. When did you first become interested in making art? I first became interested in making fine art when my mother bought me a tracing desk in the third grade. But what gave me the confidence to take classes in high school was when I won my first award in art in a citywide art contest in the seventh grade that my grandmother pressured me to enter. Finally, after she was able to convince me to use my gift, I built up enough confidence to take a chance with a new experience. After I entered, I won a free trip with the other winners to Memphis. Very Eclectic … a new world every day. I have painted violins, Barbie dolls, rocks (not what you are thinking), mailboxes, canvas, paper, acetate, wood and people. Mostly all mediums except oil. I have gotten into digital art — what a blast! What was the inspiration behind Ladies Night? After browsing some art pieces, I got into a discussion with an individual about the style and technique of some of the pieces — which, of course, I liked. I thought I would try my version of the style and pictured women at a book or card club in my mind. I find humor in the fact there is always someone disgruntled and got their feelings hurt in these social gatherings. It is just a fun, simple little watercolor. I live just north of White Hall and have been here over 35 years. I grew up on the Gulf Coast of Mississippi, and in Waco and Dallas. No formal degree but have accumulated numerous credit hours. I’m a graduate of Northwestern University’s School of Police—Staff and Command. I have completed over 4,000 hours of Law Enforcement Training and have a Senior Law Enforcement Certificate. I’m a crisis negotiator, gang specialist, public and community relations officer. I currently work as a part-time One Officer at the White Hall Police Department where I serve as an school resource officer at Moody Elementary School. I also conduct contracted trainings all over the state for law enforcement agencies and schools. I'm a retired law enforcement training sergeant, and one of the positions I held as a full-time officer was as a school resource officer, where I designed presentations that involved art, music, and magic to illustrate important life, responsibility, and communication and conflict resolution skills to our young people. I’ve presented to more than 80,000 kids in Arkansas. I have been “doodling” all my life. I usually draw from my mind’s eye — that’s where the “Mind of D” comes from. I love all kinds of art. All styles and change as often as the months that pass. I see art in everything. “White Hall Looking East” is one of 20 paintings by Little Rock’s John Kushmaul in the Potpourri 2018 art auction and Exhibition. Kushmaul, who is from White Hall, is the featured artist of the event. Known often for cityscapes and architectural landmarks of Little Rock, painter John Kushmaul has been a part of the central Arkansas art scene for more than 20 years. In Pine Bluff, he’s lending his eye for capturing scenes and structures as the featured artist for the Arts & Science Center’s Potpourri 2018 Exhibition and Art Auction. 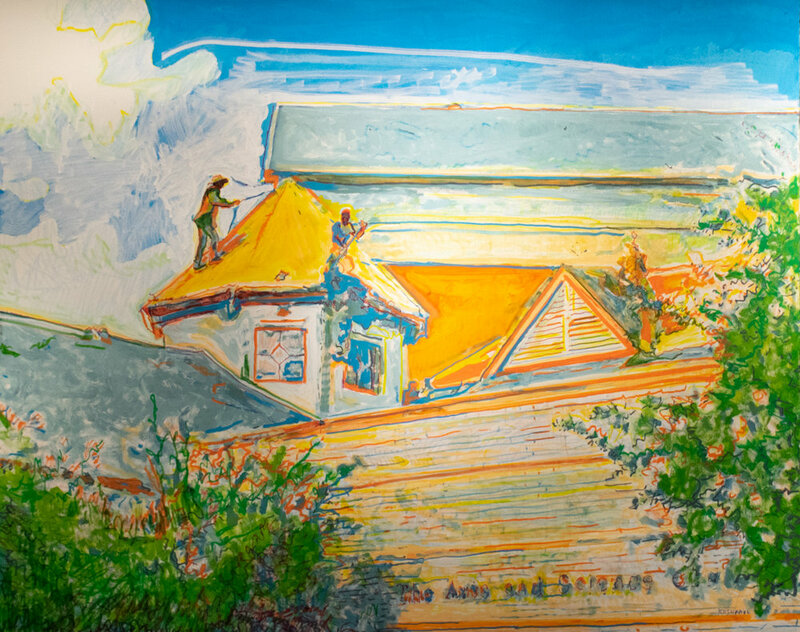 John Kushmaul captured The Arts & science Center’s roof replacement over the summer in “roofers,” one of the artworks in the Potpourri 2018 Art Auction and Exhibition. Kushmaul, who grew up in White Hall, served as juror for the 2018 Pine Bluff Art League Annual Juried Exhibition, held at ASC in September. His 20 pieces in the ASC auction include recognizable buildings from Pine Bluff and Jefferson County — such as downtown landmarks the Saenger Theatre and the Hotel Pines, and the Mammoth Orange burger stand in Redfield. He also explored less traveled or identifiable spots in the county. Train tracks and other roadways feature prominently in several other paintings. His paintings have a dream-like quality but are mostly representational, based on photos he often takes himself. “I try to keep it open for experimenting around,” he says. Kushmaul works out of a small studio above the venerable Vino’s Brew Pub in downtown Little Rock; he’s had the space for 20 years. He also lives nearby, so scenes from the capital city’s downtown are naturally seen in many of his works. Architecture is a favorite subject of his pieces. He likes varieties including buildings from the late 19th century to mid 20th century, buildings in decay, and buildings under construction. He was born in Selma, Ala.; his father was in the Air Force. His parents were both from Arkansas, and he had grandparents in White Hall. His family lived in Fayetteville, Ark., Louisiana, and Waldron, Ark., before then settling near White Hall when Kushmaul was in middle school. He graduated from White Hall High School in 1990. Right after graduating from the University of Central Arkansas with a bachelor’s degree in mass communications and a minor in art, he “lucked into” a job in broadcast news. After four years, he quit to paint full time for about 14 years. He returned to TV seven years ago, and currently works at KARK-TV as an assignment editor. Kushmaul has been showing at Gallery 26 in Little Rock’s Hillcrest neighborhood for the last 20 years; he had a show there last summer and was part of the gallery’s recent holiday show. Other Little Rock locations where his works can be seen include the CALS Butler Center Galleries in the River Market, Stephano's Fine Art Gallery, and Boulevard Bread Company’s Main Street location. Keep up with Kushmaul’s work via his Instagram page. ASC’s biennial fundraising event takes place Friday and Saturday, Nov. 30 and Dec. 1, and proceeds from Saturday’s auction help support the Center’s free arts and STEAM programming. 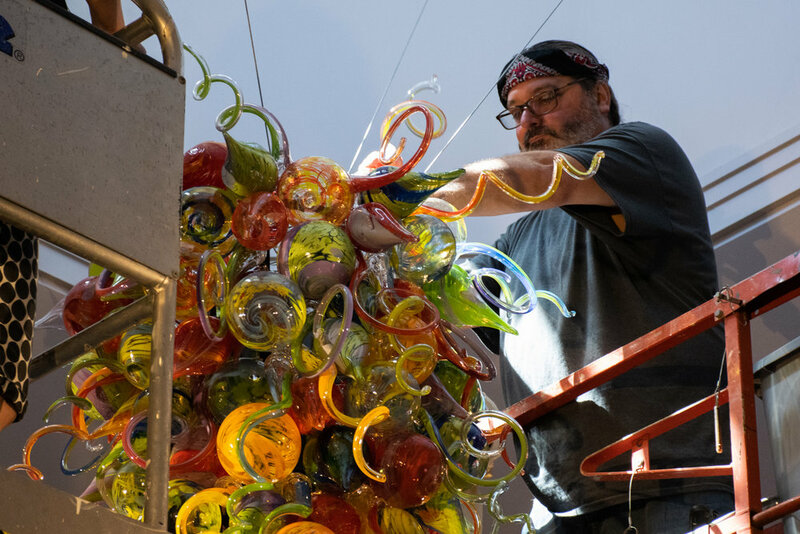 Artist James Hayes installs his blown glass sculpture, titled “Celebration Chandelier,” on Sept. 20, in the atrium of the Arts & Science Center for Southeast Arkansas in Pine Bluff. A public reception for the unveiling of sculptures by Hayes and fellow Pine Bluff-born artist Kevin Cole is scheduled for 5 p.m. Thursday, Oct. 18, at the Arts & Science Center. The Arts & Science Center for Southeast Arkansas will celebrate the installations of works by internationally acclaimed artists Kevin Cole and James Hayes, with a public reception 5-7 p.m. Thursday, Oct. 18. ASC Executive Director Dr. Rachel Miller and ASC Curator Dr. Lenore Shoults will speak at 5:30 p.m. The pieces were custom designed for the ASC atrium: Cole’s aluminum and mixed-media, wall-mounted sculpture “A Tale of Two Blessings: Passion vs Purpose,” and Hayes’ blown glass “Celebration Chandelier,” which is suspended from the rotunda. The works of art were commissioned to commemorate the Arts & Science Center’s 50th anniversary. Shoults, who has been at ASC since 2011, has looked forward to these colorful additions to the atrium for years. 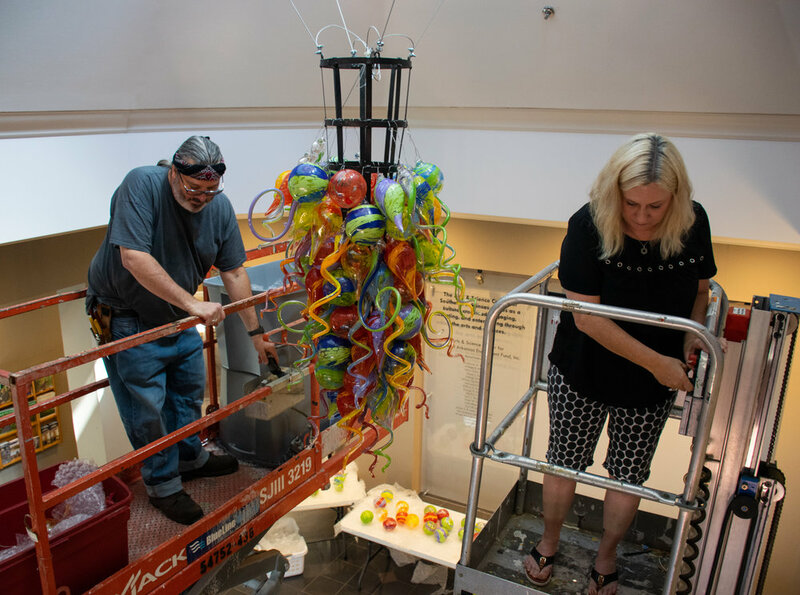 James hayes and his wife, meg, work on lifts to assemble hayes’ hand-blown chandelier in the ASC atrium. The chandelier is suspended from the atrium’s rotunda. "Seeing these stunning works of art in place is a dream come true. Kevin's sculpture and James' chandelier represent Pine Bluff's creative genius, and will provide beauty and inspiration for the thousands of people who pass through these doors." Cole and Hayes both grew up in Pine Bluff. Cole works in a variety of media such as metal, wood, paper, and other materials. His works are known for their often colorful and rhythmic shapes, textures and lines. Cole earned a Bachelor of Science degree in art education from the University of Arkansas at Pine Bluff in 1982. He went on to earn a Master of Arts degree in art education from the University of Illinois in Champaign, Ill., and a Master of Fine Arts degree in drawing from Northern Illinois University in DeKalb, Ill. Cole lives in the Atlanta area and regularly visits Pine Bluff. Hayes owns and operates the James Hayes Art Glass Company in Pine Bluff. His studio in south Pine Bluff is open to the public. A range of bright, contrasting bowls, stemware and ornaments can be found there and in showrooms and gift stores across the country. He is also known for his custom chandeliers, much like the one he created for ASC. After earning an art degree from Hendrix College in Conway in 1988, Hayes discovered glassblowing at the Arkansas Art Center Museum School. He has studied in Murano, Italy; Columbus, Ohio; and the Pilchuck Glass School near Seattle, Wash.